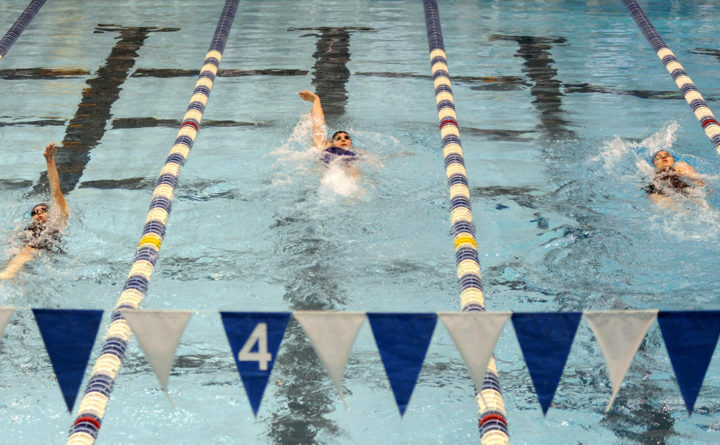 Several high school swim meets were held in the state over the weekend. 200 Yard Freestyle: 1, Brendan Grover, Brewer, 2:31.24. 2, George Albee, WA, 2:48.34. 3, Mike Nguyen, WA, 3:42.35. 50 Yard Freestyle: 1, Zain Fitzsimmons, WA, 25.19. 2, Caleb Campbell, WA, 28.40. 3, Brendan Grover, Brewer, 30.14. 4, Isaac Atkinson, WA, 30.92. 5, Aaron Lyon, Brewer, 31.43. 100 Yard Freestyle: 1, Zain Fitzsimmons, WA, 55.16. 2, Noah Tibbetts, Brewer, 59.45. 3, Aaron Lyon, Brewer, 1:11.06. 4, George Albee, WA, 1:15.77. 5, Dominic Brown, WA, 1:21.42. 100 Yard Backstroke: 1, Dakota Grover, Brewer, 1:16.76. 2, Nick Luuring, WA, 1:17.70. 3, Steven Albee, WA, 1:44.16. 4, Mike Nguyen, WA, 2:18.88. 100 Yard Breaststroke: 1, Caleb Campbell, WA, 1:22.72. 2, Jacob Harper, Brewer, 1:34.81. 3, Isaac Atkinson, WA, 1:37.51. 400 Yard Freestyle Relay: 1, WA ‘A’ (Nick Luuring, Isaac Atkinson, Caleb Campbell, Zain Fitzsimmons), 4:16.18. 200 Yard Freestyle: 1, Allison Crawford, Brewer, 2:41.47. 2, Eve Daries, Brewer, 2:43.75. 3, Kiya Oakstone, Brewer, 3:15.60. 200 Yard IM: 1, Claire Warmuth, Brewer, 2:38.39. 2, Caroline Blain, Brewer, 2:39.49. 3, Kaycee Laffey, Brewer, 3:09.99. 50 Yard Freestyle: 1, Sydney Blain, Brewer, 26.51. 2, Adelaide Ross, Brewer, 28.37. 3, Lauren Tardy, Brewer, 36.39. 4, Vivian Noakes, WA, 41.02. 5, Phoebe Colbeth, WA, 41.10. 100 Yard Butterfly: 1, Sydney Blain, Brewer, 1:10.13. 2, Emma Butterfield, Brewer, 1:15.77. 3, Allison Crawford, Brewer, 1:27.68. 100 Yard Freestyle: 1, Grace Milan, Brewer, 1:20.68. 2, Katie Byrne, Brewer, 1:29.37. 3, Vivian Noakes, WA, 1:32.65. 4, Kaitlyn Smith, Brewer, 1:46.67. 500 Yard Freestyle: 1, Adelaide Ross, Brewer, 6:12.76. 2, Claire Warmuth, Brewer, 6:23.09. 3, Grace Goodwin, Brewer, 8:00.27. 200 Yard Freestyle Relay: 1, Brewer ‘B’ (Grace Milan, Javi Mora, Julia Daries, Lauren Tardy), 2:32.31. 2, Brewer ‘C’ (Rachel Lawrence, Sydney Blain, Eve Daries, Allison Crawford), 2:32.73. 3, Brewer ‘A’ (Mia Cattan, Kaitlyn Smith, Katie Byrne, Alyssa Cottrell), 2:40.59. 100 Yard Backstroke: 1, Annie Fernandez-Faucher, Brewer, 1:30.77. 2, Julia Daries, Brewer, 1:50.94. 3, Emma Norton, Brewer, 2:04.82. 100 Yard Breaststroke: 1, Caroline Blain, Brewer, 1:22.61. 2, Emma Butterfield, Brewer, 1:24.50. 3, Mia Cattan, Brewer, 1:51.15. 4, Phoebe Colbeth, WA, 2:05.51. 400 Yard Freestyle Relay: 1, Brewer ‘C’ (Emma Norton, Grace Goodwin, Claire Warmuth, Adelaide Ross), 5:12.23. 2, Brewer ‘A’ (Kate West, Kaycee Laffey, Allison Crawford, Caroline Blain), 5:12.89. 3, Brewer ‘B’ (Kiya Oakstone, Eve Daries, Annie Fernandez-Faucher, Emma Butterfield), 5:16.53. 200 Yard Medley Relay: 1, Ellsworth ‘A’ (Barry, Kristy S 15, MacPherson, Caitlin 16, Clarke, Ellie H 17, Nelson, Miriam L 17), 1:59.65. 2, MDI ‘A’ (Smith, Addy, Sullivan, Sadie, White, Mei Mei, Genrich, Loren ), 2:09.91. 3, Ellsworth ‘B’ (Mazgaj, Abby 15, Frank, Lillian P 15, Hammer, Katie J 17, Hanson, Lilja 15), 2:16.50. 4, MDI ‘B’ (Underwood, Olivia, Granholm, Daisy, Welch, Naomi, Dentremont, Sage ), 2:24.32. 50 Yard Freestyle: 1, MacPherson, Caitlin, ELLS, 26.62. 2, Granholm, Daisy, MDI, 27.60. 3, Hanson, Lilja, ELLS, 30.17. 4, Genrich, Loren, MDI, 30.22. 5, Welch, Naomi, MDI, 30.30. 100 Yard Freestyle: 1, Nelson, Miriam L, ELLS, 59.11. 2, Brown, Ruby, MDI, 59.15. 3, Naggert, Anna, MDI, 1:03.04. 4, Mazgaj, Abby, ELLS, 1:08.55. 5, Welch, Naomi, MDI, 1:09.06. 100 Yard Butterfly: 1, Barry, Kristy S, ELLS, 1:03.32. 2, Horton, Adria, MDI, 1:06.30. 3, Saltysiak, Maria, MDI, 1:07.08. 4, White, Mei Mei, MDI, 1:12.56. 5, Hanson, Lilja, ELLS, 1:19.31. 6, Hammer, Katie J, ELLS, 1:19.58. 500 Yard Freestyle: 1, Horton, Adria, MDI, 5:38.48. 2, Barry, Kristy S, ELLS, 5:53.40. 3, Smith, Addy, MDI, 6:05.57. 4, Frank, Lillian P, ELLS, 6:24.19. 200 Yard Freestyle Relay: 1, Ellsworth ‘A’ (Clarke, Ellie H 17, Nelson, Miriam L 17, MacPherson, Caitlin 16, Barry, Kristy S 15), 1:46.26. 2, MDI ‘A’ (Saltysiak, Maria, Brown, Ruby, Granholm, Daisy, Horton, Adria ), 1:49.46. 3, MDI ‘B’ (Underwood, Olivia, Genrich, Loren, White, Mei Mei, Naggert, Anna ), 1:58.88. 4, Ellsworth ‘B’ (Atwater, Marissa K 16, Hanson, Lilja 15, Moseley, Kristen 16, Stevens, Sydney M 17), 2:04.72. 100 Yard Backstroke: 1, Clarke, Ellie H, ELLS, 1:04.98. 2, Saltysiak, Maria, MDI, 1:08.15. 3, White, Mei Mei, MDI, 1:17.73. 4, Underwood, Olivia, MDI, 1:21.77. 5, Stevens, Sydney M, ELLS, 1:23.96. 100 Yard Breaststroke: 1, MacPherson, Caitlin, ELLS, 1:16.93. 2, Sullivan, Sadie, MDI, 1:18.70. 3, Granholm, Daisy, MDI, 1:24.59. 4, Moseley, Kristen, ELLS, 1:26.03. 5, Dentremont, Sage, MDI, 1:31.47. 400 Yard Freestyle Relay: 1, MDI ‘A’ (Saltysiak, Maria, Smith, Addy, Brown, Ruby, Horton, Adria ), 4:08.67. 2, Ellsworth ‘A’ (Frank, Lillian P 15, Mazgaj, Abby 15, Hammer, Katie J 17, Moseley, Kristen 16), 4:24.85. 3, MDI ‘B’ (Naggert, Anna, Welch, Naomi, Sullivan, Sadie, Fabian, Yarrow ), 4:41.42. 200 Yard Freestyle: 1, Sullivan, Liam, MDI, 1:50.75. 2, Hill, Sean, ELLS, 1:51.15. 3, Walls, Julian, MDI, 2:07.49. 4, Schleif, Sam, MDI, 2:08.57. 5, Nelson, Calvin, ELLS, 2:14.12. 6, Ulichny, Ryan W, ELLS, 2:14.63. 200 Yard IM: 1, Scheff, Henry m, ELLS, 2:13.62. 2, Markosian, Beckett, ELLS, 2:16.99. 3, Saltysiak, Ponce, MDI, 2:17.12. 4, Benson, Jacob, MDI, 2:31.14. 5, Estacio, Luiz, MDI, 2:33.58. 6, Fendl, Lucas, ELLS, 2:35.89. 50 Yard Freestyle: 1, Holmes, Camden M, ELLS, 21.66. 2, Woodworth, Tyler, MDI, 22.81. 3, Partridge, Nick T, ELLS, 23.85. 4, Weaver, Isaac, MDI, 24.57. 5, Frank, Carter J, ELLS, 25.81. 6, Genrich, Jonathan, MDI, 25.91. 100 Yard Butterfly: 1, Willis, Tyler, MDI, 57.78. 2, Valleau, Zeke, MDI, 58.30. 3, Hill, Sean, ELLS, 58.65. 4, Scheff, Henry m, ELLS, 1:00.29. 5, Brenner-Simpson, Ian, ELLS, 1:04.32. 6, Mains, Isaac, MDI, 1:04.55. 100 Yard Freestyle: 1, Woodworth, Tyler, MDI, 50.50. 2, Pelletier, Sam J, ELLS, 51.79. 3, Saltysiak, Ponce, MDI, 54.41. 4, Schleif, Sam, MDI, 58.14. 5, Osterlin, Ben, ELLS, 58.93. 6, Frank, Carter J, ELLS, 58.98. 500 Yard Freestyle: 1, Holmes, Camden M, ELLS, 5:12.43. 2, Parker, Cody, MDI, 5:25.57. 3, Willis, Tyler, MDI, 5:30.94. 4, Markosian, Beckett, ELLS, 5:37.56. 5, Walls, Julian, MDI, 6:56.45. 6, Mazgaj, Ben P, ELLS, 6:56.56. 200 Yard Freestyle Relay: 1, Ellsworth ‘A’ (Markosian, Beckett 17, Partridge, Nick T 14, Scheff, Henry m 15, Holmes, Camden M 18), 1:34.79. 2, MDI ‘A’ (Mitchell, Sam, Saltysiak, Ponce, Schleif, Sam, Weaver, Isaac ), 1:41.02. 3, Ellsworth ‘B’ (Frank, Carter J 17, Mazgaj, Ben P 17, Brenner-Simpson, Ian 17, Ulichny, Ryan W 14), 1:45.98. 4, MDI ‘B’ (Benson, Jacob, Estacio, Luiz, Walls, Julian, Parker, Cody ), 1:49.13. 100 Yard Backstroke: 1, Sullivan, Liam, MDI, 55.13. 2, Pelletier, Sam J, ELLS, 55.24. 3, Valleau, Zeke, MDI, 1:01.81. 4, Brenner-Simpson, Ian, ELLS, 1:07.25. 5, Mains, Isaac, MDI, 1:07.86. 6, Clark, Hunter J, ELLS, 1:12.23. 100 Yard Breaststroke: 1, Partridge, Nick T, ELLS, 1:05.57. 2, Weaver, Isaac, MDI, 1:07.57. 3, Ulichny, Ryan W, ELLS, 1:12.28. 4, Mitchell, Sam, MDI, 1:13.83. 5, Estacio, Luiz, MDI, 1:14.95. 6, Nelson, Calvin, ELLS, 1:15.12. 200 Yard Medley Relay: 1, Bangor ‘A’ (Connor Prouty, Carson Prouty, Tate Scovil, Griffin Erb), 1:50.23. 2, Hampden ‘A’ (Jakob Archer, Matthew Vine, Cameron LaBree, Chris Chaffe), 1:50.87. 3, Bangor ‘B’ (William Gagnon, Jesse Karnes, Adam Elkadi, Ben Reed), 2:23.37. 4, Hampden ‘B’ (Derrick Cunningham, Anthony Hall, Steven Santiago, Johnny Hanson), 2:23.45. 200 Yard Freestyle: 1, Fritz Oldenburg, BANG, 1:59.95. 2, Joshua Watson, BANG, 2:08.53. 3, Gavin Kearns, HAMP, 2:20.34. 4, Ethan Grover, BANG, 2:23.54. 5, Steven Santiago, HAMP, 2:36.38. 6, Sam Parsons, HAMP, 3:07.63. 200 Yard IM: 1, Carson Prouty, BANG, 2:13.49. 2, Matthew Vine, HAMP, 2:23.37. 3, Simon Socolow, BANG, 2:27.99. 4, Tate Scovil, BANG, 2:42.91. 50 Yard Freestyle: 1, Connor Prouty, BANG, 23.50. 2, Chris Chaffe, HAMP, 24.30. 3, Zach Steigert, HAMP, 24.65. 4, Johnny Hanson, HAMP, 32.53. 5, Jesse Karnes, BANG, 34.09. 100 Yard Butterfly: 1, Cameron LaBree, HAMP, 54.69. 2, Zach Steigert, HAMP, 1:09.26. 3, Tate Scovil, BANG, 1:09.40. 4, Simon Socolow, BANG, 1:11.02. 5, Adam Elkadi, BANG, 1:18.83. 100 Yard Freestyle: 1, Connor Prouty, BANG, 54.07. 2, Chris Chaffe, HAMP, 57.56. 3, William Gagnon, BANG, 1:09.07. 4, Derrick Cunningham, HAMP, 1:09.63. 5, Johnny Hanson, HAMP, 1:14.31. 6, Ben Reed, BANG, 1:19.53. 500 Yard Freestyle: 1, Carson Prouty, BANG, 5:01.16. 2, Jakob Archer, HAMP, 5:41.38. 3, Joshua Watson, BANG, 5:58.17. 4, Griffin Erb, BANG, 6:05.74. 5, Gavin Kearns, HAMP, 6:36.16. 6, Anthony Hall, HAMP, 7:05.46. 200 Yard Freestyle Relay: 1, Hampden ‘A’ (Chris Chaffe, Matthew Vine, Zach Steigert, Cameron LaBree), 1:36.65. 2, Bangor ‘A’ (Connor Prouty, Simon Socolow, Fritz Oldenburg, Carson Prouty), 1:37.12. 3, Bangor ‘B’ (Ethan Grover, William Gagnon, Jesse Karnes, Joshua Watson), 1:59.84. 4, Hampden ‘B’ (Gavin Kearns, Steven Santiago, Sam Parsons, Anthony Hall), 2:04.87. 100 Yard Backstroke: 1, Fritz Oldenburg, BANG, 1:06.24. 2, Jakob Archer, HAMP, 1:10.34. 3, Adam Elkadi, BANG, 1:14.71. 4, Derrick Cunningham, HAMP, 1:25.93. 5, William Gagnon, BANG, 1:26.75. 100 Yard Breaststroke: 1, Cameron LaBree, HAMP, 1:05.22. 2, Matthew Vine, HAMP, 1:10.78. 3, Griffin Erb, BANG, 1:18.76. 4, Ethan Grover, BANG, 1:19.29. 5, Anthony Hall, HAMP, 1:26.41. 6, Jesse Karnes, BANG, 1:34.74. 400 Yard Freestyle Relay: 1, Bangor ‘A’ (Simon Socolow, Joshua Watson, Griffin Erb, Fritz Oldenburg), 3:49.96. 2, Hampden ‘A’ (Zach Steigert, Jakob Archer, Gavin Kearns, Derrick Cunningham), 4:10.58. 3, Bangor ‘B’ (Adam Elkadi, Tate Scovil, Ben Reed, Ethan Grover), 4:30.23. 4, Hampden ‘B’ (Steven Santiago, Johnny Hanson, Sam Parsons, Harry Willard), 5:18.67. 200 Yard Medley Relay: 1, Bangor ‘A’ (Rachel Hand, Susanna Sellnow, McKayla Kendall, Maddie Huerth), 1:58.34. 2, Bangor ‘B’ (Alexa Jarvis, Georgia Jones, Claire Pellegrino, Ginny Hunt), 2:13.71. 3, Hampden ‘A’ (Sydney Jordan, Rachel Vine, McKayla Poulin, Mikaela Shayne), 2:16.62. 200 Yard Freestyle: 1, McKayla Kendall, BANG, 2:08.09. 2, Cara Whitmore, HAMP, 2:26.06. 3, Sara Poll, HAMP, 2:36.42. 4, Alexa Jarvis, BANG, 2:36.54. 5, Claire Nickels, HAMP, 2:54.83. 6, Maya Elkadi, BANG, 2:55.28. 200 Yard IM: 1, Rachel Hand, BANG, 2:26.14. 2, Rachel Vine, HAMP, 2:39.20. 3, Silva Davids, BANG, 2:43.30. 4, Kelly Pellegrino, BANG, 2:43.88. 50 Yard Freestyle: 1, Susanna Sellnow, BANG, 27.06. 2, Sydney Jordan, HAMP, 29.45. 3, Cara Whitmore, HAMP, 29.72. 4, Mikaela Shayne, HAMP, 30.43. 5, Libby Colley, BANG, 31.11. 6, Mackenzie Morin, BANG, 34.54. 100 Yard Butterfly: 1, Claire Pellegrino, BANG, 1:10.37. 2, Silva Davids, BANG, 1:13.12. 3, Maddie Huerth, BANG, 1:14.16. 4, Kaylee Mayo, HAMP, 1:27.81. 100 Yard Freestyle: 1, Ginny Hunt, BANG, 58.43. 2, Susanna Sellnow, BANG, 1:01.82. 3, Mikaela Shayne, HAMP, 1:09.46. 4, Alexa Jarvis, BANG, 1:09.86. 5, Kaitlynn Raye, HAMP, 1:13.53. 6, Julie Llerena, HAMP, 1:17.92. 500 Yard Freestyle: 1, McKayla Kendall, BANG, 5:41.73. 2, McKayla Poulin, HAMP, 6:49.34. 3, Sara Poll, HAMP, 7:10.78. 4, Maya Elkadi, BANG, 7:34.73. 5, Katherine Clukey, BANG, 7:37.84. 200 Yard Freestyle Relay: 1, Bangor ‘A’ (Rachel Hand, Maddie Huerth, Silva Davids, McKayla Kendall), 1:51.85. 2, Hampden ‘A’ (Rachel Vine, Sydney Jordan, Julie Llerena, Cara Whitmore), 2:02.14. 3, Bangor ‘B’ (Libby Colley, Anya Ganesh, Georgia Jones, Maya Elkadi), 2:03.07. 4, Hampden ‘B’ (Claire Nickels, Kaitlynn Raye, Marilyn Manigoult, Sara Poll), 2:19.16. 100 Yard Backstroke: 1, Claire Pellegrino, BANG, 1:11.58. 2, Sydney Jordan, HAMP, 1:15.34. 3, Kelly Pellegrino, BANG, 1:16.35. 4, Libby Colley, BANG, 1:19.85. 5, McKayla Poulin, HAMP, 1:22.05. 6, Kaitlynn Raye, HAMP, 1:33.32. 100 Yard Breaststroke: 1, Rachel Vine, HAMP, 1:17.18. 2, Rachel Hand, BANG, 1:19.08. 3, Ginny Hunt, BANG, 1:22.31. 4, Maddie Huerth, BANG, 1:26.58. 5, Emily Hatch, HAMP, 2:04.85. 400 Yard Freestyle Relay: 1, Bangor ‘A’ (Claire Pellegrino, Alexa Jarvis, Ginny Hunt, Susanna Sellnow), 4:16.36. 2, Hampden ‘A’ (Cara Whitmore, McKayla Poulin, Mikaela Shayne, Sara Poll), 4:40.41. 3, Bangor ‘B’ (Libby Colley, Katherine Clukey, Hana Woodard, Kelly Pellegrino), 5:15.23. 4, Hampden ‘B’ (Kaylee Mayo, Claire Nickels, Julie Llerena, Emily Hatch), 5:33.82.